Bruce Anstey won the opening Supersport race at the MCE Ulster Grand Prix on the Valvoline Padgetts Honda. Flying Kiwi Bruce Anstey celebrated his 12th MCE Ulster Grand Prix victory in the opening Supersport race at Dundrod on Saturday. Pole man Anstey quickly opened a lead of two seconds after setting a hot pace on the opening laps, making the most of his experience after light rain showers had left the 7.4-mile course patchy in places. However, Ian Hutchinson soon hit his stride when the track rapidly began to dry out, and slashed Anstey’s advantage to 0.8 seconds. 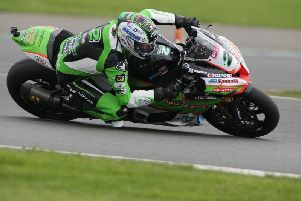 The English rider was poised to throw down a challenge, but the race was red-flagged due to an incident at Joey’s on the fourth lap involving Olie Linsdell, who escaped serious injury. The result was declared based on positions at the end of lap four, with Anstey taking the win from Hutchinson (Came BPT Yamaha). Manx rider Conor Cummins narrowly claimed third on the Valvoline Padgetts Honda ahead of Dean Harrison (Silicone Engineering Kawasaki). William Dunlop finished fifth on the IC Racing Yamaha ahead of Peter Hickman (Trooper Beer Kawasaki), with southern Irish rider Derek McGee (Yamaha) and Christian Elkin (Triumph) the top eight. Michael Dunlop was a retirement on his MD Racing Yamaha.